We’ve already talked about how to prepare for the beginning of the school year, but what do we do when it actually starts? The school year brings new schedules, new activities, and new challenges. 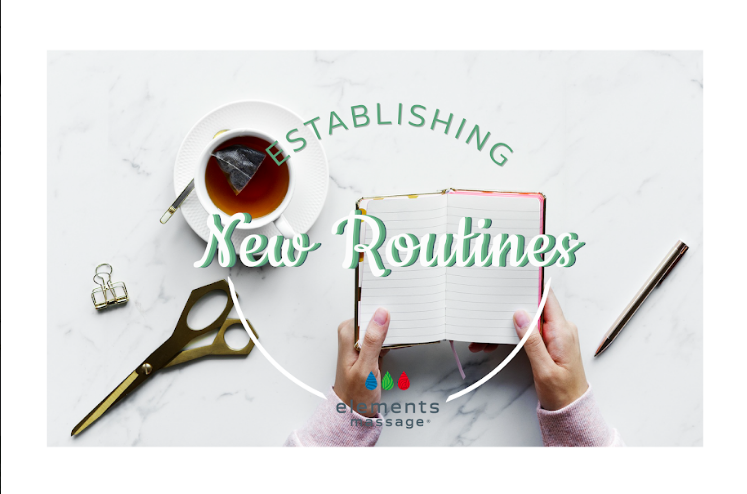 How do we tackle these new routines that will form throughout the year? Not many people like change, including the team at Elements Massage. Unfortunately, change is inevitable. Especially if you have kids changing grades, or you’re going back to school yourself. Every year has its new experiences and obstacles that you'll have to face. But, with the right preparation and mindset, you can make every year just as good as the last. For those who don’t deal with change well, it can have a real impact on your mental and physical health. Change can cause a lot of stress on your brain and body. Learning how to deal with the stress of these changes is difficult, but not impossible. Thankfully there are many ways to make the shifts in your life almost enjoyable! Sometimes you’re so set in your ways, you don’t even want to acknowledge that things are about to change. While being in denial may could postpone the your feelings of stress, it will inevitably cause more stress later on. The sooner you realize things are changing, the sooner (and quicker) you can cope with the shift in your life. Don’t procrastinate, it will be ok! Sure, a schedule change or a newborn, a new school year, or something else can be a very stressful change. But sometimes people will feel stressed when a positive change is coming their way. Take a step back and look at what is changing. Did you just graduate? Get a new job? These are positive changes! Don’t let the stress mask the excitement of what is to come. Even if certain things are shifting in your life, try and keep some things the same. If you are committed to fitness, try and keep your fitness routine the same or workout around the same time everyday. Do you meal prep? Keep that up. Whatever you can keep the same, do it. It will make you feel as if less has actually changed and you can transition into your new school, job, life, etc more easily. Sure, you’re stressed, that is going to happen. But there are ways to minimize that anxiety that is taking over. If you aren’t a regular exerciser already, start exercising more. Running, walking, lifting, yoga, choose your vice. Or if you already do workout regularly, try something else out. See if yoga or lifting helps your mood if you’re normally a runner - or vice versa. Eating healthy can also help bring down the anxiety levels. While stress eating is a real thing, try and avoid it. If you eat unhealthy, your body is not properly fueled to take on your day and it may even stress you out more that you aren’t being healthy. Try and get sufficient carbs, protein, and fats in so that your brain and body are ready to take on task, activity, or change life throws at you! In the beginning, you may feel stressed, anxious, sad, angry, confused, or just even awkward in your new schedule or new stage of life. But you’ll soon realize that it will become your norm! Think about all the changes you had in the past and how you dealt with those. Over time, this will become your regular life. Until that happens, just relax, take it day by day, and look at the positive aspects that come from this new part of your life. Yes, change can affect a lot. It can affect your mental health and cause stress, anxiety, depression. It can affect your physical health causing you to stress eat or exercise less, cause fatigue, etc. However, in every change there is something good. All you have to do is find the positive aspects of whatever is changing and go with it! Realize that much of your life will still be the same, keep your schedules and activities as regular as possible as you transition into whatever is new in your life. Eventually this will be your regular life and it will feel normal, even great! While we can’t expect to completely skip over the stress of change, we can minimize and shorten it. In the mean time, while you’re stressing about the new school year, a new sports schedule, a new job, a new baby, or something else, minimize your stress at Elements Massage. We will help rid the negative feelings of change from your body until you’re only left with the positives. Call our studio or go online to book an appointment with any of our amazing massage therapists!